Hello and welcome to the Grand Opening of Topflight Stamps, LLC!! We can't wait to share with you our fun and different art stamps from all around the world. What makes us different? You can shop for hard to find, international stamps all in one place. And, we offer free shipping for US addresses for orders over $50!! I'm excited to share a card I created using the beautiful stamp set "Hummingbirds" from Darkroom Door. This set features several hummingbirds in various sizes mounted on ezmount cling rubber. I love hummingbirds, and this set is truly a must have if you are a lover of the hummers like I am. 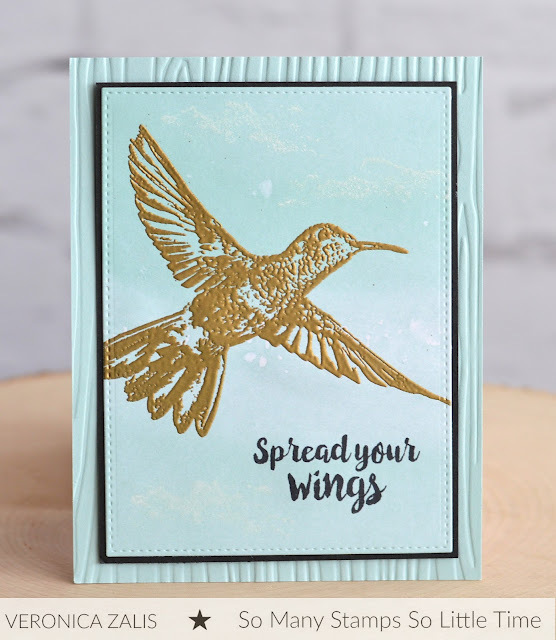 I embossed my hummingbird using gold embossing powder. The background features the "Clouds" background stamp by Katzelkraft. I used white craft ink to create a subtle, airy background behind my embossed hummingbird. I am so happy you stopped by, and I am thrilled that I was invited to help welcome Topflight Stamps LLC to the crafting world! Be sure to check out all these blogs and comment for your chance to win the grand prize!! Hi Veronica! You card is just delightful...a breath of fresh air. :) It's as though you designed the perfect Spring card. A beautiful golden Hummingbird with tiny, white clouds in a blissfully blue sky. And a lovely sentiment to top it all off. I really love all the little details that make your card just "pop". Gorgeous design ! It's always nice to have added choices in the crafting community , very excited to welcome you into my world . So so gorgeous, Miss Lady!!! Simply perfect...embodies peace, hope and joy! Your Gold Hummingbird is Amazing!! I just love it!!! Yeah a large sized beautiful hummingbird! Perfect combination!...Darkroom Door AND Katzelcraft! What a lovely card. Beautiful robins egg blue color! Images embossed with gold are always beautiful Thanks for reminding me to do it. Very pretty card. I LOVE this pretty embossed bird! This is so gorgeous and inspiring! Your design really highlights the beauty of the hummingbird. Lovely card! This is a very beautiful card. Love the embossed bird. Love the background with the Gold emboss hummingbird! Just gorgeous! Thanks for the inspiration! Very pretty. Thanks for sharing your talents and inspiration with us. Very pretty with the embossed hummingbird. Beautiful. Love the gold on the gorgeous background. Love the embossed hummingbird. Love the color of the card too! Such a great image and embossing is always a hit. Lovely card. What a sweet card, love the bird.. so pretty! Beautiful layers and hummingbird image! Lovely card! Pretty card. Love those hummers. Wow...great use of embossing powder and color! Love the faux stitched panel. Lovely card. The colours are so pretty. The thin black border really pops the hummingbird image. What a BEAUTIFUL card Veronica!! Love the color, textures and Hummingbird! Love the hummingbird. Thanks for sharing. Thanks for inspirational ideas. Have to create cards for my upcoming classes and I am getting wonderful ideas from your blog hop. Love this stamp. So very pretty. Love the hummingbird and the subtle cloud background. So striking! Love the gold on the soft blue background! This is just beautiful Veronica. A great card! Beautiful use of white ink on the background. The gold hummingbird is quite striking against it. A gorgeous card! Love the hummingbird! Hummingbirds are one of my favorites! Beautiful embossed card! I love this technique and use it a lot. The base of your card is also great in wood style. Wonderful card! Thanks for sharing! What a beautiful card - I love the hummingbird - So happy that we will now be able to get Darkroom Door stamps and other international companies easier here in the US! What a fun hop today! Using the gold is wonderful. Stunning CAS with the embossed humming bird. LOVE it! Love hummingbirds and yours is beautiful!